Muharram/Ashura marks the beginning of the Islamic year. It is the 10th day of Muharram the first month of the Islamic calendar. Special prayer meetings in the home or mosques and daylight fasting are ways some Muslims honor the holiday. Other Muslims mourn for the month, remembering the Battle of Karbala. It is a gazetted holiday with government, banks, and post offices are closed. The Battle of Karbala is remembered by the Shia Muslims when in 680 CE Imman Hussain, Prophet Muhammad's grandson, died. 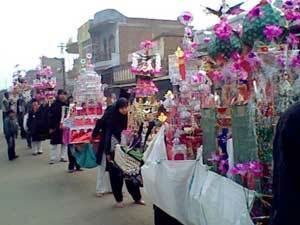 It is mainly a Islamic holiday, although other religions take part in the activities in India.